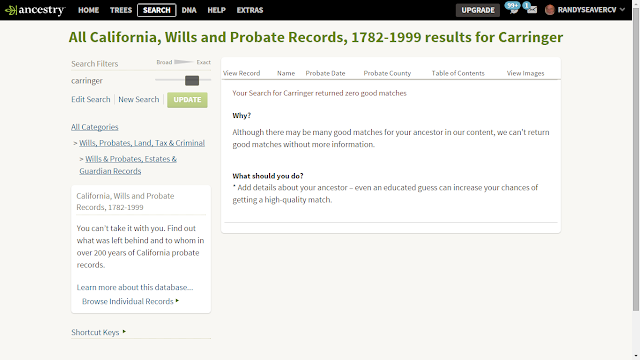 Genea-Musings: Did Ancestry.com Index Every Will and Probate Record in The Wills and Probates Databases? 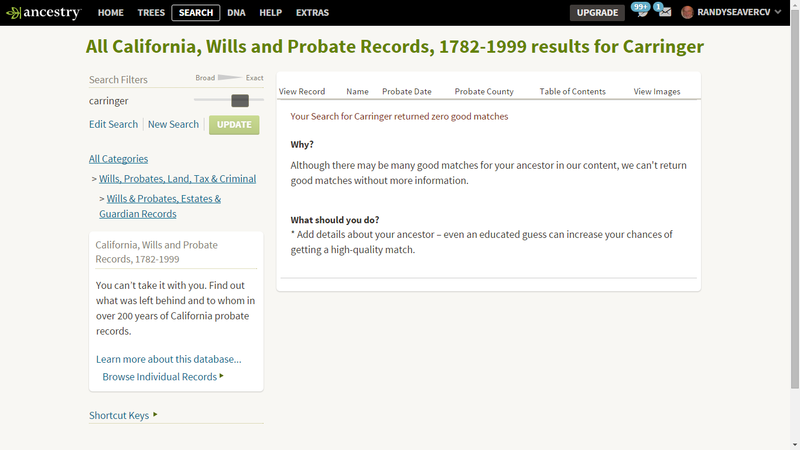 Did Ancestry.com Index Every Will and Probate Record in The Wills and Probates Databases? Christine Manczuk on the Ancestry Island blog reminded me that a user can browse the Wills and Probates collections on Ancestry.com - see her post San Diego Will and Probate Files ARE Available at Ancestry Through the Browse Option (posted 5 November 2015) for details on how to find Counties and Volumes of probate records for a specific County in any state. 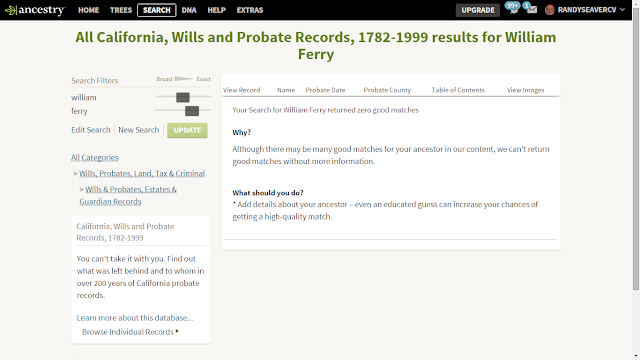 Ancestry.com claims that these Wills and Probates databases are indexed. When they first were provided in early September, I went through my list of ancestors in California and searched by name with not-exact spellings. I found none of the persons I searched for. I didn't know if my ancestors had a probate record or not, but it was worth searching. That certainly shows me that they didn't add any surname of Carringer to the index for all of California. Is that accurate? I don't know. I am looking for a probate record for David Jackson "D.J." Carringer, who died in San Diego city on 20 January 1902. I thought that I would browse through some of the volumes from this time period to see if he was just not indexed. After a bit of checking, I determined that the Probate Orders and Decrees volumes 26-28 for 1902 to 1904 was the most likely set that would hold a probate record. If I found one, I figured that the first entry would be in the January to June period of 1902, with possibly more entries later. I found the January 20, 1902 period on this record set in volume 27, and the court dates at the top of the pages are sequential - they don't skip back or forth. I have searched about 140 images so far by checking the neatly written "In the matter of the estate of ..." on the left margin of each page for each matter brought before the court. There are often three to six of these on each image. Here is the lower part of one of the pages, image 238 of 621 from Volume 27 of these records. William H. Ferry's name can be seen on the left page of the image above at the bottom of the image. There were no search results for any of the names I listed. There were very few results for any of the names I tried - I probably tried 50 or so. Only one matched the date for which I had found the record. I doubt that the Ancestry index is so bad that less than 5% (and perhaps only 2%) of the indexed names are correct. 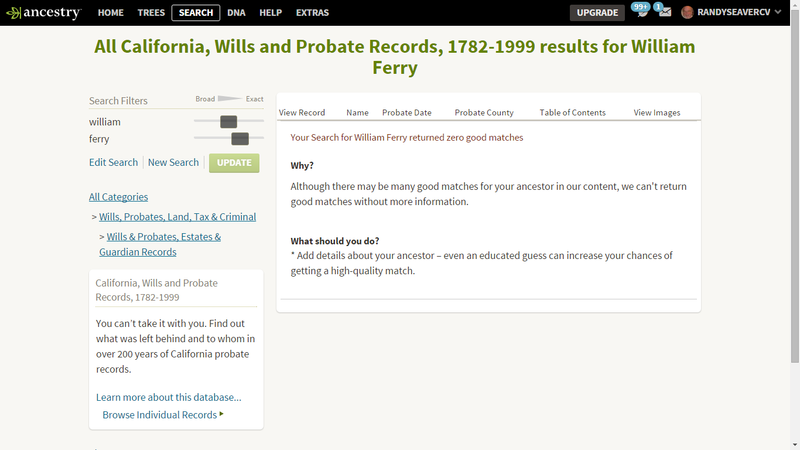 I think it is more likely that Ancestry.com did not index some of the volumes of wills and probate records for San Diego County. A search in the collection for the number of index entries in San Diego County indicates that there are 156,155 names. I checked 20 of the entries, and they are all from the Record of Wills volumes. 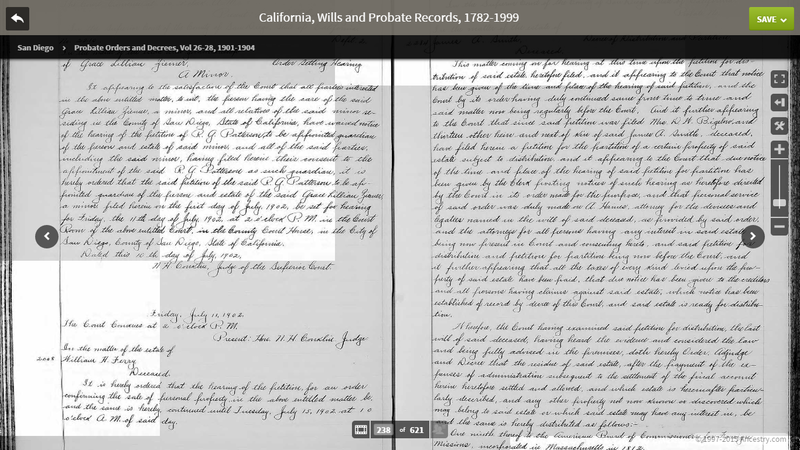 So it appears that the indexing is selective - there are 22 volumes of Probates and Decrees from 1886 to 1917, and two volumes of Record of Wills from 1897 to 1918. There is nothing in the "About this database" text that indicates that some of the volumes are not indexed. The implication in the description of all of these probate databases is that they are all indexed and that searches are reliable, at least as far as indexing can be. I'm disappointed that Ancestry did not flag the volumes that were indexed or were not indexed. That would have been relatively easy to do, and would have helped users understand that they would have to browse some volumes. Obviously to me, that is not the case. A user needs to do some testing in these probate databases to see if names in specific volumes are actually indexed. If they are not, then the only way to search those volumes is to search them manually - page by page and sometimes line-by-line - to determine if there is a record for their ancestor. That is a lot more difficult than just using the search engine. I'm not complaining here...I can do this manual search at home any time of day rather than on microfilm at the Family History Library or at a local FamilySearch Center. Thank you, Christine, for reminding me of the browse function in these databases. Now I need to complete the 1902 Probates and Decrees volume. It should take another two hours or so. I'll let my readers know if I find anything for my second great-grandfather, David Jackson "D.J." Carringer, in these records. The wills and probate came from Family Search. I had been reviewing family wills when they suddenly disappeared off of Family Search and then a few months later, they appear on Ancestry. Now they are harder to search an available to less people (i.e. a paid site vs a free site). One of these days Ancestry is going to run themselves out of business if they keep screwing around with the databeses. Did the volumes you wanted to look at not have indexes at the front of the books? Was there no overall estate index? These seem to be as difficult to work with as the Sussex County, DE deeds books uploaded several months ago. The database description maintains that they are indexed, but Ancestry failed to obtain and upload the deeds indexes that do exist at the DE Archives, and a good half of the deeds books are indexed only by grantees -- the rest have no index at all, and some of the volumes are missing entirely from the digitized-microfilm upload. Overall, a sloppy piece of work. nope, no internal volume indexes (I checked) and no overall Estate index or Proceedings index in the digitized collection. I, like you, am grateful for the records being more accessible. But this is so discouraging. Every new database I work with needs to be tested. I've checked other states/counties and have found that the same situation applies to them as well. I agree with Randy that Ancestry really should have indicated which record sets had been indexed.